Last weekend we had the opportunity to hook up with some friends for a trip down South to ride dirt bikes. The group we went with were very experienced with this area having been riding there many times before and it really showed, it was hard to keep up! White Wash Sand Dunes is located between Green River and Moab Utah and is part of a very large area containing some of the best off-roading and scenic terrain anywhere. We arrived at the parking area near the dunes Thursday morning to join a small group that arrived the night before and were later joined by more. We did a small ride to warm up and then rode South down the wash to the trail head of what is known in this group as "The Luge", but is more commonly called Dead Cow Wash. The "Luge" nickname comes from the rounded shape of a good portion of the trail. The trial is a flat out blast as you'll see from the video. We had a great time working down the trail that ended at the green river. The trail we did is an out and back type although you can complete the loop as shown on the map. On the way back we explored another spur that ended in a steep walled canyon with a pool of water. It was an awesome and beautiful ride that I hope to repeat. The trail head is located at the South end of White Wash as shown on the map. Once this is reached, you'll travel South along the fence line until you reach what is known as "red gate" as indicated by the flag on the map(click the flag icon for a pic). The route from the trailhead to the river is 5.5 miles one way. The loop will add another 5 miles approx. Difficulty: Moderate, I took my 8 and 10 year old. This trail pushed their limits. Spectacular scenery, let alone being able to ride through it! Is this designated trails for dirt bikes, atv's etc, Private land? How do you find these places, and get permission to ride on them? Looks like fun! I'd prefer to hike it on my own two feet though. I wondered if you ever wrecked. That steep hill at the end gave you problems I guess. Crazy fun! It's unbelievable scenery. It's public land near Green River/Moab. There are 2 national parks and 1 state park in the area, but still many more acres open to riding on designated trails. I've been down there for many years in our rock buggy..you could spend a lifetime and not see it all. Some is private land and closed to riding so you do have to pay attention. Here is a link to a trail map just in the white wash dunes area!! This is maybe 1/8 of the total area. Dahlene, we do wreck occasionally...most of the time it's pretty harmless though with the correct gear. We really had a great time. 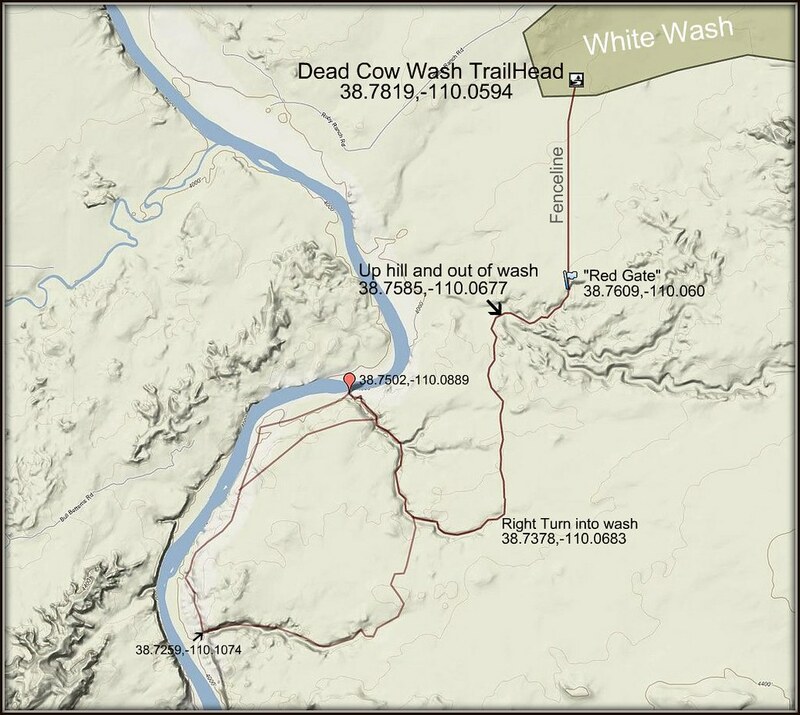 From the map, it appears that this trail might be called "Dead Cow Wash" or maybe "the tubes"..officially. Does anyone know for sure? Awesome pics! I like the scenery. Glad you had fun, I need to go to the Moab area soon! Is that trail wide enough for my buggy? Yea, for sure. There were some narrow optional routes, but also wider routes around them. Anything around 50" and under should have no problem.